"This is Wizard. His mom was a yellow Lab and father a German Shepherd. I wanted everyone to see how cute he his! Best dog ever. He is almost 6 years old. Wizard was easily trained and knows over 40 commands. A great guard dog. Great with animals. He can jump and clear 6 foot." The German Sheprador is not a purebred dog. 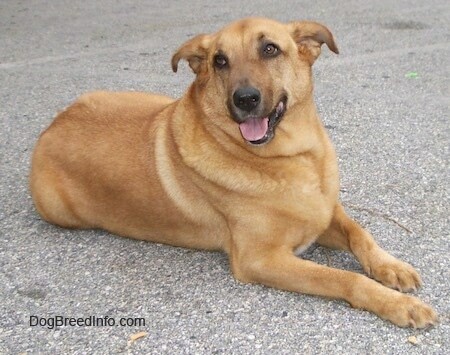 It is a cross between the German Shepherd and the Labrador Retriever. The best way to determine the temperament of a mixed breed is to look up all breeds in the cross and know you can get any combination of any of the characteristics found in either breed. Not all of these designer hybrid dogs being bred are 50% purebred to 50% purebred. It is very common for breeders to breed multi-generation crosses. 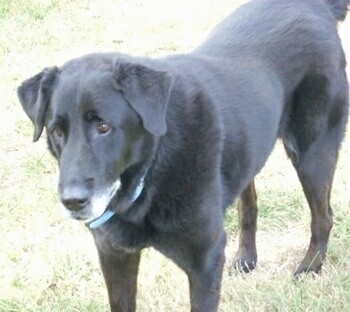 Bailey the 3/4 Labrador Retriever / 1/4 German Shepherd mix at 9 1/2 years old. 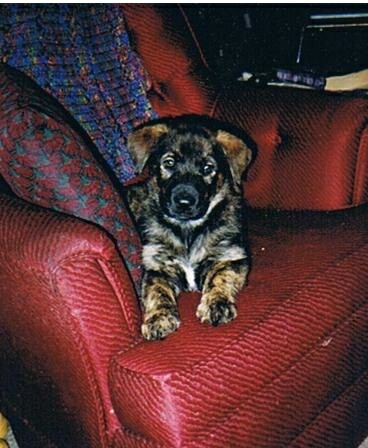 His dad was a black Lab and his mom was a half Lab half German Shepherd mix. 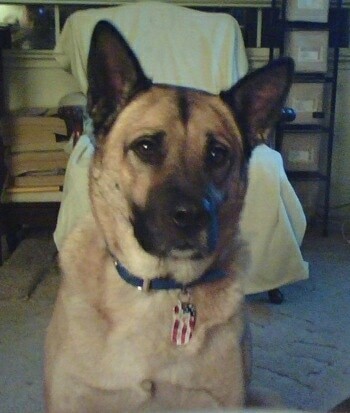 "Thena is a 4 year old Sheprador. She has an insane ball drive and as such is incredibly easy to train. She is great with other dogs and with people (including kids). Loves chasing a ball into the water and is eager to please. Her double coat requires a good brushing at least every week in the summer time, but she tends to stop shedding in winter. Not really an apartment dog. This dog will keep you busy!!" 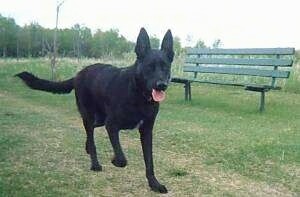 "My dog, May, is a 2 year old black Lab that bred with a German Shepherd. 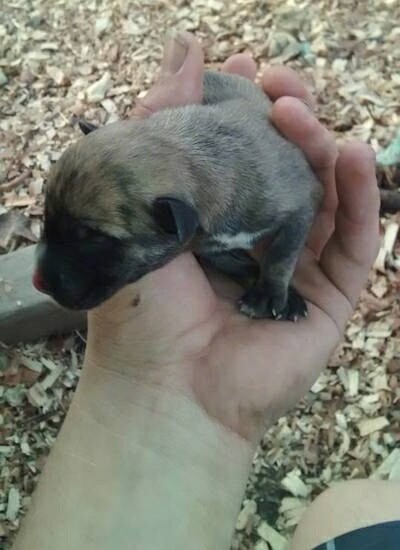 This is one of her newborn babies who we named March"
Bug the German Sheprador at 12 years old—"Bug was about as smart as they come. She understood many words and could swim, play ball and balance on a beam. She loved people and other creatures but was ready to stand her ground if necessary." 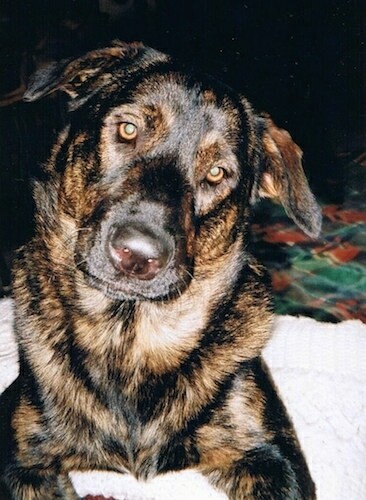 Taz the German Sheprador at 10 years old—"Taz is a German Shepherd / Yellow Lab mix. He goes ballistic over the snow and the water. He'll show the playfulness of the Lab and the intelligence of the Shepherd, and is very good at trying to sneak away for walks on his own. He's been one of the best dogs we've ever had and he's gorgeous! I am involved with a program called Freedom Tails. I have been the Editor and Photographer for the newsletter since 2009, along with every other aspect of the program. Even becoming an AKC Good Citizen Evaluator last year. The program is located at Stafford Creek Corrections Center, a men’s prison of approximately 2000 offenders, in Aberdeen, WA. We bring in shelter dogs that might otherwise be euthanized, retrain them in social skills and basic commands, and get them adopted back out to society. At this time, we have found new loving, forever homes for over 250 dogs." "This is Roy, our yellow Lab / German Shepherd at 6 years old. We have had him since he was about a year old. He is extremely friendly and very affectionate. However, the combination of these two breeds has led to excessive shedding. Brushing every day almost isn't enough! But he enjoys every minute of the attention he gets when being groomed. 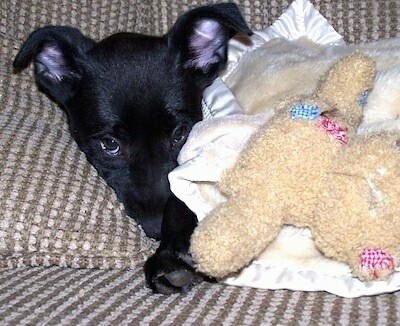 He is very well tempered, keeping playtime in the house to a minimum, but acts like a puppy again once he gets outside." 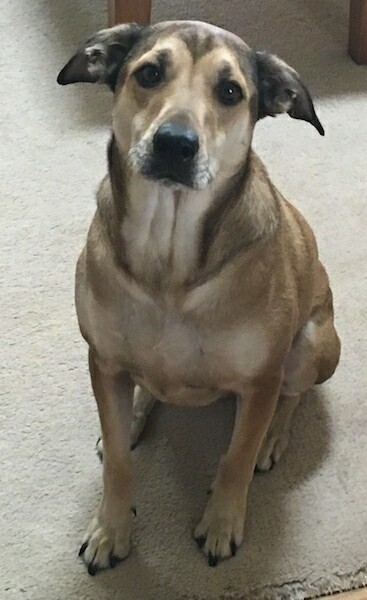 Banjo the German Sheprador (German Shepherd / Labrador Retriever) mix at 11 years old—"We adopted Banjo when she was 1, and now she's a very dignified old lady! Exceptionally trainable and obedient dog. Did a DNA test just for fun and confirmed she was a German Sheprador. Two of the best breeds rolled into one." "This photo is of Teagen, our Lab / Shepherd / Unknown mix at 2 years old! Teagen is almost 7 now. He is always happy, loves everyone and will kiss you forever if you let him! We rescued Teagen from a shelter when he was 9 months old and he became an instant part of our family! Teagen is small for his mix of breeds (he weighs less than 60 lbs.) but isn't he cute?" 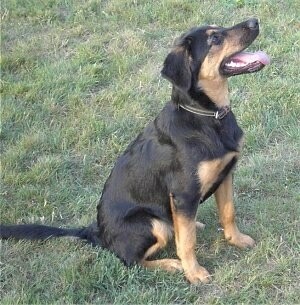 "Dakota is my 1-year-old German Shepherd / Labrador Retriever mix. 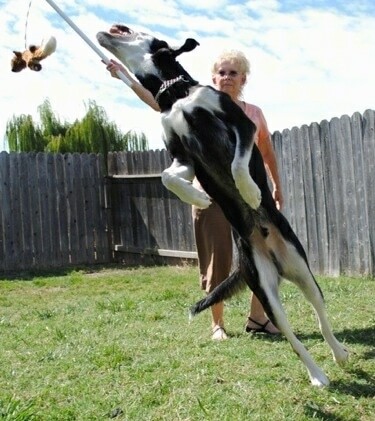 He is training for dock jumping, agility and obedience, and is doing awesome! He has been a great partner, a good guard dog and a great friend. He is always wanting to do something and definitely not the type of dog for an impatient person. We often work with the flirt pole, and he will chase it for hours." "This is Russell. 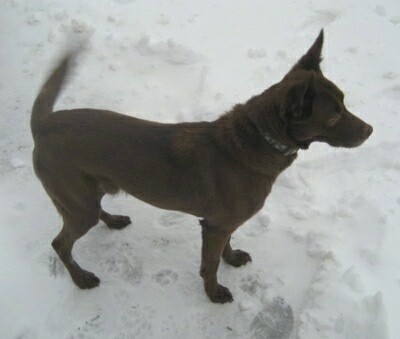 He is a well-behaved 6-year-old chocolate Lab / German Shepherd mix. He rarely barks, and is GREAT with everyone. He is walked on a regular basis, and loves to play fetch. I took this picture during our rare white winter here in Virginia in the front yard. He was brought home by my wife after her visit to a girlfriend's house over the holidays. I did not know what to expect, but I have no complaints about our ol' man." 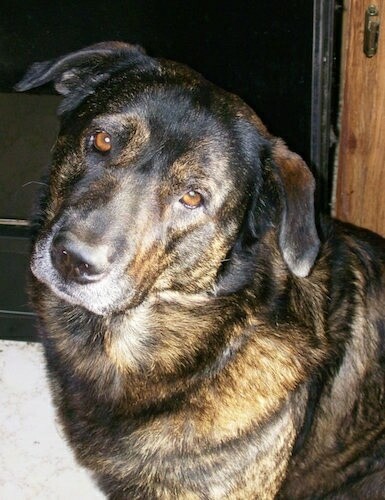 "Buddy the Lab / German Shepherd mix at 8 years old—he is very, very loving, but very protective as well. 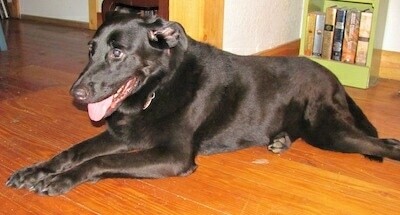 He is smart and playful, but is a great large indoor dog at the same time." 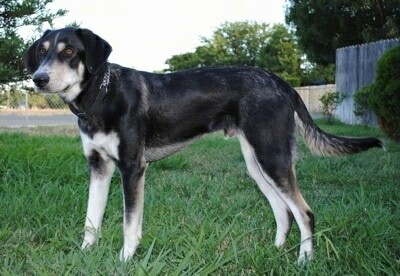 "Here is a picture of our 8-month-old German Shepherd / Labrador mix that we adopted from our local animal shelter. The first few days with him have been a really good experience. He has only barked once briefly each night (probably from the train that I can't hear, but he can). He enjoys his daily walks and does an excellent job!" 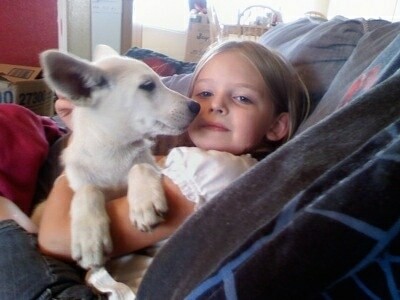 "This is Luna and our daughter Ally. Luna is an American White Shepherd / Lab mix. She was 2 months old in this picture and was already getting big! We adopted her from our local SPCA. Her and her sisters were found as babies in a dumpster. She is very peaceful and loves to lie on a blanket on the floor at my feet. As a puppy she did not like to be outside alone and peed a little when she met someone new. I look forward to seeing how beautiful both Luna and Ally become." 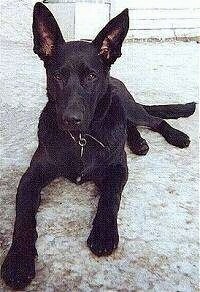 "Pictured is my dog Riley, a black Lab (mother) x German Shepherd (father), shown here at 10 months old. He weighed over 90 pounds before he was a year old. He is a total sweetheart who thinks he's a lap dog even though he lives outside. He is not high energy, but seems to prefer lying around on the porch. He is full of curiosity and loves water." "This is my dog. 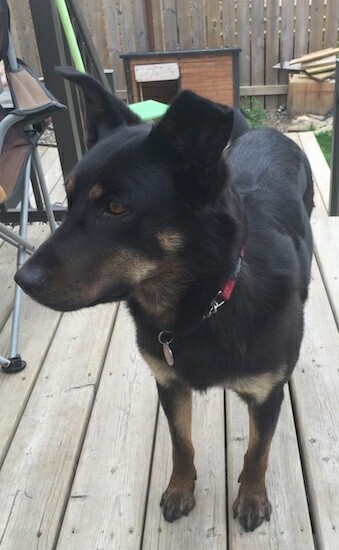 She is a 4-year-old German Shepherd / Lab mix. She gets very excited to see anyone and is very lovable. She likes tearing the stuffing out of her toys before she'll play with them. Once in a while she will get into the garbage and chew things she's not supposed to." 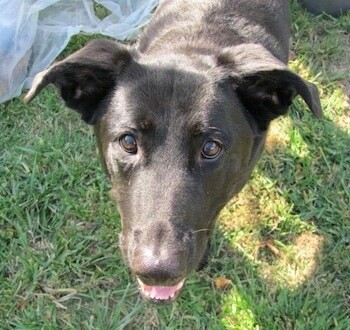 Eeyore is a one-year-old Black Lab / Shepherd mix. 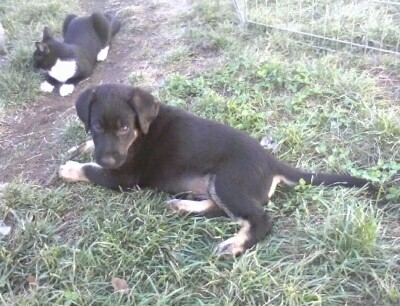 "Ace is a Black Lab / German Shepherd mix. Ace has the coat, loyalty and guarding ability of a German Shepherd, but the gentleness, energy and goofiness of a black Lab. He is 10 years old and weighs approximately 70 lbs. Ace has several acres to run on and he loves playing with his best friend Cali (a Westie / Maltese mix). Ace has the best temperament and behavior of any dog we’ve ever owned. We love our Acey boy." 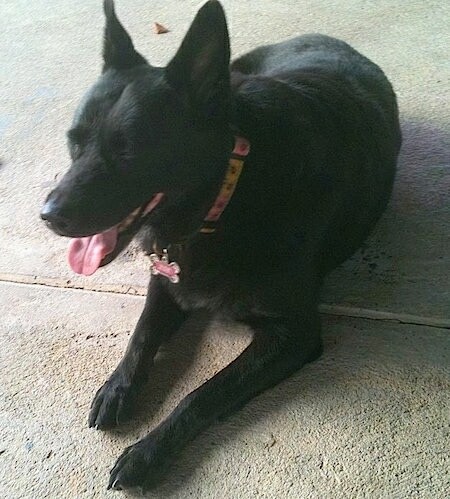 "Blaze is a black Lab / German Shepherd. 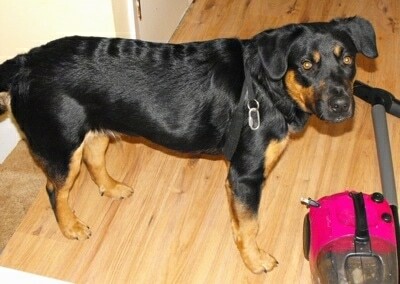 He is 8 months old, loves children and loves other dogs. He enjoys his daily run and anything outdoors." 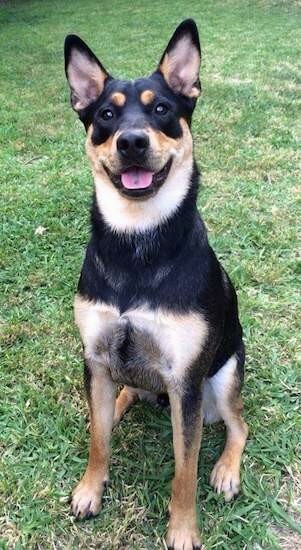 "This is Tyson, our Lab / Shepherd mix at ten months old, rescued, our best friend. We were lucky enough to find him at a rescue league when he was eight weeks old. He brightens up our lives every day, he is a social, well-behaved, and loyal dog.... Great addition to our family!!!" "This is my adopted dog Sam. 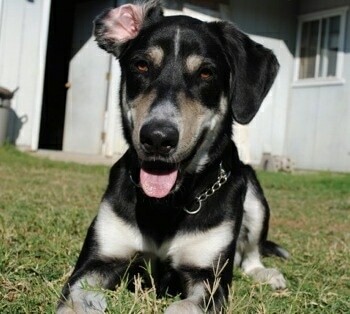 He is a German Shepherd / Black Lab mix. He is missing his left front leg. I found Sam at a rescue when he was ten months old and it was love at first lick! He has been with us for two and a half years now and sleeps in my bed every night—he's definitely a mamma's boy. Sam loves swimming, playing tennis, basketball and soccer. He runs like the wind! Sam is spoiled rotten and since I am a massage therapist, he gets a bedtime massage every evening. Very smart, protective, loving, devoted, patient, obedient. He is the perfect dog and a blessing to have in my life. He is my canine soul mate."